Ageless Derma Retinol and Vitamin K Eye Cream contains 2% Vitamin K combined with 0.1% Retinol and Vitamins E & C to reduce under-eye circles, puffiness, and wrinkles around the eye area. This gold-colored cream comes in a nice pump bottle and spreads on smoothly. I've been using it for the past couple weeks and my eye area is smoother and less dry than it used to be. My dark circles are reduced, but not completely gone - Sadly, they probably will never completely disappear. But at least they are less prominent now and there is less puffiness. The Retinol-based formula seems to very effective. You can read more about the ingredients here: http://www.agelessderma.com/ingredients-detail.aspx. I found that the pump can sometimes emit more cream than I need for one application, so I have learned to push the pump down more lightly to get just the right amount. I would recommend using this at night to let it work overnight. I would also recommend to avoid putting this above your eyelid or anywhere that it might run into your eyes, as it will be irritating to your eyes. 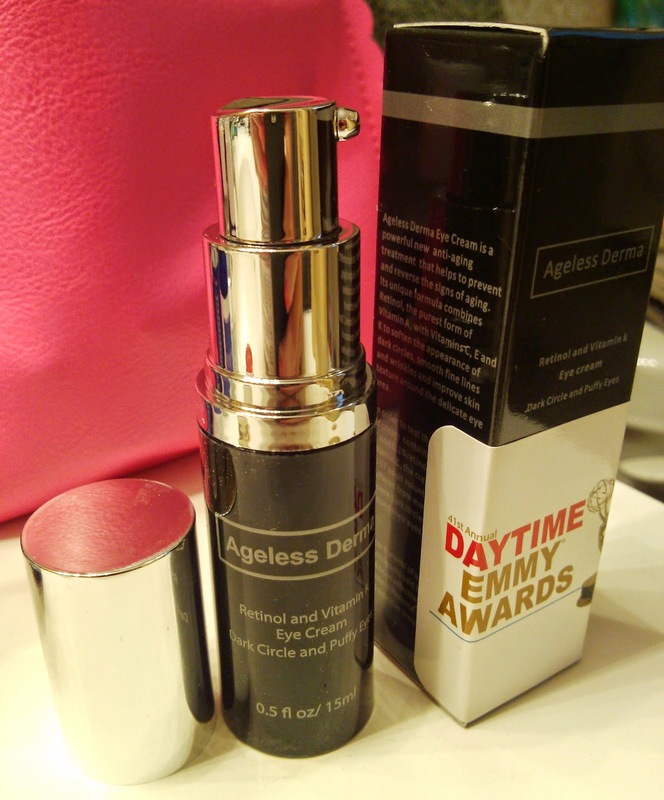 This eye cream was included in the Daytime Emmy Awards gift bags that were given to all attendees and nominees - so it's kind of a big deal ;) Seriously though, I really like the Ageless Derma products that I have tried and think they are very effective in making skin look more youthful.